Find out more about Star Fighters here. 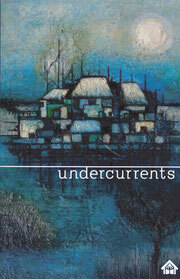 Join the adventure with undercurrents - an anthology edited by Benjamin Scott and featuring his story, Tunnel Vision. This anthology is a chance for both writer and reader alike to step out from the mundane, the prosaic and the quotidian, to launch their boat onto a river which could take them anywhere, from an American airport to the tunnels of Venus, from biblical times to far into the future. It’s a chance to be someone else, to see the world from a different point of view, from a Norfolk veteran to Lancastrian weavers, from an apprentice engineer to a ventriloquist. Each story is the end of one journey and the beginning of another. For all nine writers, there are many more journeys to be made, many more stories to be written and this collection is a map of where we are now – each of us planting a flag on new territory to claim it for ourselves and our readers. Now you have the chance to explore with us, if you’re willing to slip your moorings and take the plunge. The mask dangled from his mother’s soft fingers; the round happy features of a Chinese boy swinging gently on the elastic. It was almost as if the boy was laughing at him. At least they had chosen to capture Samuel Quek’s face without a scowl, thought Eamon." Tunnel Vision is a YA tale from the Venus colony in the distant future. Eamon Stevens, a hardworking sub-apprentice, would rather be studying than attending a birthday party. But snubbing the spoilt Samuel Quek, the Face of Venus, could ruin his career. However, a surprise celebratory treat from Samuel’s father gives Eamon a glimpse of the past that will change the rest of his life. 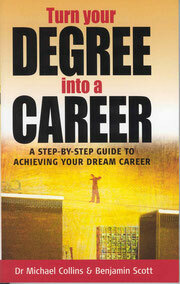 Turn Your Degree into a Career is a practical and easy-to-use guide for university graduates and students. It is based on the knowledge and experience of Dr Michael Collins, who for over five years ran a successful course at the University of East Anglia on how to successfully pursue opportunities in the job market. As one of Dr Collins' students, Benjamin owed his first job to what he learnt on the course. It was his techniques and advice that helped him beat over 1,000 applicants for his first job in advertising. Benjamin's experiences putting the theory into action as well as the feedback from other former students and guest lecturers (HR directors and recruitment specialists) have all helped make this book practical and comprehensive. It covers everything you should need, from deciding what career you might want to pursue to taking a year out and going to interviews. Importantly, it also tells you how to stay motivated and how to pursue your own dreams, rather than other peoples. Both authors want to wish you the best of luck in your career search.